University Press of Kentucky, 9780813147031, 328pp. 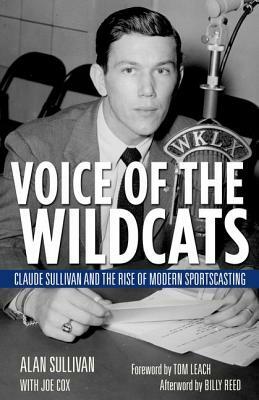 As one of the first voices of the University of Kentucky men's basketball program, Claude Sullivan (1924--1967) became a nationally known sportscasting pioneer. His career followed Kentucky's rise to prominence as he announced the first four NCAA championship titles under Coach Adolph Rupp and covered scrimmages during the canceled 1952--1953 season following the NCAA sanctions scandal. Sullivan also revolutionized the coverage of the UK football program with the introduction of a coach's show with Bear Bryant -- a national first that gained significant attention and later became a staple at other institutions. Sullivan's reputation in Kentucky eventually propelled him to Cincinnati, where he became the voice of the Reds, and even to the 1960 Summer Olympic Games in Rome. Featuring dozens of interviews and correspondence with sports legends, including Wallace "Wah Wah" Jones, Babe Parilli, Cliff Hagan, Ralph Hacker, Jim Host, Billy Reed, Adolph Rupp, and Cawood Ledford, this engaging biography showcases the life and work of a beloved broadcast talent and documents the rise of sports radio during the twentieth century. Alan Sullivan is a healthcare architect.Joe Cox is an attorney and the coauthor of 100 Things Wildcats Fans Should Know & Do Before They Die.